Wedding bells are popular favors at receptions. They come in a range of styles with prices to match all budgets. Wedding bells for reception favors offer a universal appeal and go with any theme. First and foremost, there's a reason why these favors are nicknamed "kissing bells." It's because they replace the popular spoon on glass method for signaling a kiss between the bride and groom. If the tinkling bell sound is going to annoy you, don't give them as favors. Remember, your guests will be ringing them throughout the event. You can find bells that don't ring if you think that would be better for your sanity. Certain metals rust quickly. If you're purchasing inexpensive favors, find out if they'll rust if exposed to moisture. If it rains on your wedding day or even if one of your guests has a humid home, the favor will have to be tossed in the trash if it rusts, and that's a waste. Porcelain wedding favors are a little more expensive but they don't rust. In fact, many of them are of heirloom quality. Many of them aren't as noisy as other wedding bell favors too. 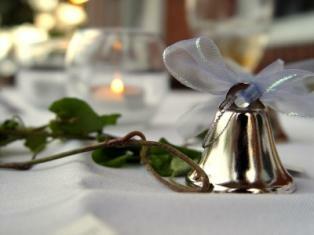 Porcelain wedding bell favors are fragile, however. You can also purchase wedding bell favors made of glass or crystal. These too are very fragile. They make a very attractive and classy favor for your guests though and have a pretty ring. Set each favor between each couple's place setting or have a special favor table. As each guest or couple enters the wedding hall they can take a favor. Tie a place card with table number to the favor with a decorative ribbon so each person knows where she is to sit. If noise, rust or possible breakage doesn't appeal to you, consider edible wedding bells. Send your guests home with favors made from chocolate or cookies. Edible bells come in a variety of flavors and colors. Purchase decorative boxes for an elegant presentation. If you're afraid of wedding favors collecting dust or being put in storage, edible favors are surely the way to go. Wrap with us lists several models including gold, silver and crysal. Prices range from $1.25 to $4.99. Beau-Coup offers a lovely selection of wedding bells including butterfly bells and on the higher priced Precious Moments wedding bells. The Wedding Shop at The Knot also offers a small selection of wedding bell favors.